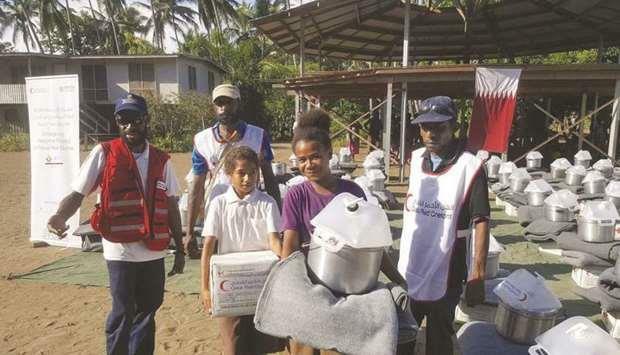 (MENAFN - Gulf Times) Qatar Red Crescent Society (QRCS) has completed a relief intervention to help the victims of earthquakes and floods in Papua New Guinea, with funding from Qatar Fund for Development (QFFD). The project was co-ordinated with Papua New Guinea Red Cross Society (PNGRCS) and the International Committee of the Red Cross (ICRC). It was designed to alleviate the suffering of those affected by the earthquake, by providing shelter, water, and sanitation aid for Pinu village, Gabadi Kairuku Hiri District, Central Province. A relief delegation was sent from Doha to hold co-ordination meetings with relevant partners, and update the field action plan accordingly. They worked hard to overcome the challenges, finish all the shipment clearing and logistics, and conduct the packaging and distribution process. A total of 200 families, or 1,200 persons, received household hygiene kits, water buckets, cooking pots, jerry cans, and blankets. In preparation for the coming monsoon season, a stockpile of relief items was stored at ICRC warehouses, to ensure timely response. These included 400 household hygiene kits, 700 tarpaulins, 700 kitchenware kits, 1,200 water buckets, and 1,000 blankets. QRCS head of Disaster Preparedness, Subhi Fahid Ejjeh, said, 'The partnership started last year in September, with a memorandum of understanding (MoU) signed between PNGRCS and QRCS to help the vulnerable people whose lives were affected by disasters. Ejjeh expressed QRCS's thanks to the Government of Papua New Guinea and the National Disaster Office for facilitating the release of relief containers from the port. 'This donation was made by Qatar, through QFFD, for the benefit of earthquake victims in Hela last year, and the people affected by floods early in January 2019. We hope to continue working closely with PNGRCS, Ejjeh added. Pinu disaster chairman, Kevau Ao, commended the joint work by PNGRCS and QRCS to bring relief to his village. 'I was surprised to see that the hygiene kits had all the necessary items for both men and women. We are very happy for these contributions to our living standards. Such assistance was quite useful and met the needs of the affected population, he stated. PNGRCS secretary-general, Uvenama Rova, welcomed the support from QRCS. 'The items received will go towards helping the people whose lives have been devastated by natural disasters, he said. 'PNGRCS appreciates this support from QFFD through QRCS.